A new eLibrary serving two nursing colleges in Bauchi and Sokoto states has given students up-to-date materials to further their studies. Bauchi, Nigeria—When nursing student Mustapha Mahmood needed to review a textbook from the library at the College of Nursing and Midwifery in Bauchi State, he often had to wait his turn. But now the aspiring health worker only has to go online through the school’s new eLibrary to get the information he needs. Mahmood is one of 1,055 students, combined between the two institutions, benefiting from this Jhpiego-supported initiative to strengthen nursing education. It is part of the U.S. Agency for International Development’s Targeted States High Impact Project (TSHIP), which is led by John Snow, Inc. TSHIP is a six-year, comprehensive, capacity-building project that is supporting the states of Sokoto and Bauchi with high-impact interventions to reduce maternal, neonatal and child mortalities. Throughout its 41-year history, Jhpiego has been working in Nigeria with the goal of preventing the needless deaths of women and their families. Jhpiego continues to support competency-based, pre-service education to build the capacity of nurses, midwives and other health professionals to provide lifesaving, quality health services for their fellow Nigerians. Through TSHIP and Jhpiego’s support for pre-service education, digital libraries were established at the School of Nursing in Bauchi as well as the College of Health Sciences at Usmanu Danfodiyo University in Sokoto State earlier this year. The objective of this eLibrary project is to provide nursing and midwifery students with the latest in educational materials through this newly introduced technology. TSHIP financed the initial improved connectivity through local, higher-speed Internet providers, servers, linked computer workstations and the installation of a tower and Wi-Fi reaching campus libraries and dormitories. 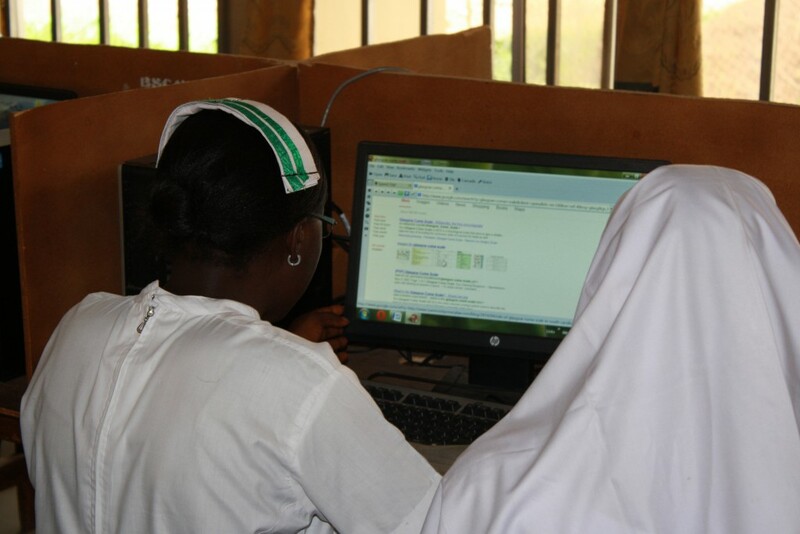 Bauchi nursing students using Google. “The eLibrary consists of a number of resources including access to the websites our materials are hosted on; we have individual login passwords as well as the ability for our professors to develop entirely online courses,” Mallam Bappah Bura, a library administrator, explained at the official handover ceremony of the library earlier this summer. The eLibraries also allow students to download videos and simulation exercises for their classes. For Saratu Yakubu, a third and final year nursing student, the eLibrary has shaped the way she has been able to complete her senior research project. “Life has become easier for me; I can lie back in bed and read at night. All I need to study is available through the eLibrary,” she told a TSHIP Pre-Service Advisor. Yakubu also was pleased that she could now access the most up-to-date articles through the eLibrary connection to HINARI (a free journals database provided through the World Health Organization), where in the past she and others would search for recent articles without success. Mahmood Dan Asabe, a 45-year-old tutor and current library user, said the new online access has increased usage of the physical library as students use the eLibrary. “Rate of participation in the library was not encouraging because there were very few users except during exams,” said Asabe, an alumnus of the school. He shared one experience he had with students while working in the school library, shortly after the eLibrary had gone online. “I asked some students to go back to class, but they told me they were given an assignment online instead of having a traditional lecture,” he said. Asabe is also currently using the eLibrary to complete his PhD. “I have access to my research materials, it’s very convenient and the power is constant,” he said.